Stampin' Anne: Stippled Blossoms for Dynamic Duos #50 AND Vicki B.
Stippled Blossoms for Dynamic Duos #50 AND Vicki B.
Hello there and welcome to "Monochromatic" week at Dynamic Duos! This week is special over at Dynamic Duos for a few reasons. First of all, it is our last week with our AMAZING current Design Team. These gals are unbelievable and it is so bittersweet that we celebrate each of them this last week for their awesome creative inspiration. THANK YOU, ladies! Words cannot express how much I appreciate these gals and everything they have done over the past 6 months. The next reason that this week is special is because we are honoring one of our very special Design Team members, Vicki Burdick to celebrate her birthday! HAPPY BIRTHDAY, VICKI!! Vicki is so amazingly talented and an honest-to-goodness sweet gal. I have admired Vicki's creations for about as long as I have been blogging. 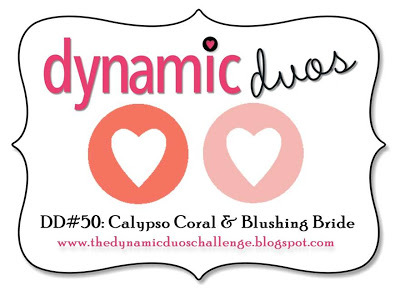 My dear friend Lesley is hosting a blog hop in honor of the birthday girl. Check it out HERE. For my card, I used a set (Stippled Blossoms) that I bought simply because of Vicki's inspiration. She ROCKS this stamp set, no joke! The challenge colors work so well with the two-step stamping. Honestly, two-step stamping usually freaks me out because I am one of those people that has to have everything line up PERFECTLY. But after I stamped this image (without trying too hard to line it up) I was happy with how it looked...on the first try! Whoa, that never happens. Must be the "Vicki Mojo"! Super sweet Anne, you know I love that stamp set, I used it too this week! Your post brings tears to my eyes. I almost wish time would stand still so my time on the DT I wouldn't be over, but I will still be playing along! :) Thank you so much for having me as part of the team, an experience I will hold dear. Thank you for the sweet birthday wishes, you all have made my day/week very special and one I will not soon forget! Firstly, Anne Marie, thank you for having me on the Dynamic Duos Design Team, it has been a wonderful experience and I will certainly miss it, and everyone who has been a part of it. 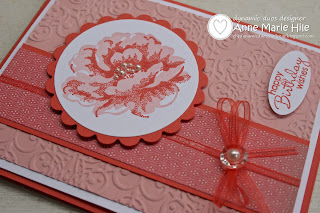 Your card is gorgeous, and I'm with you on the Two Step stamping thing.... yours has turned out beautifully though, and I love the pretty bow embellishment. It has been wonderful to work with you over these last 6 months and I really look forward to seeing more of your gorgeous and inspirational designs. I see Vicki written all over this card! You've captured her style yet added your own flair too....fabulous, Anne Marie! I want to say thank you for inviting me to be a designer and I have truly enjoyed every single minute of it! I will certainly keep in touch with you through your blog and fb! I have loved getting to know you a little more through this whole process! We couldn't have asked for a better manager and I wish you much luck with the next team! Hugs! 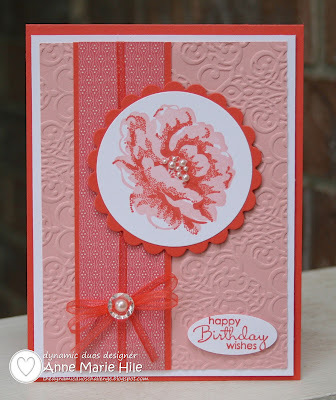 Gorgeous card, Anne Marie! I'm sure Vicki loved her card :o) Thanks so much for all you do each week to make being on the DD design team so easy. It's been a fabulous experience for me and I look forward to being a player for a while! Take care, and I'll be seeing you regularly through your blog! So very pretty Anne Marie! Love the embossed background with your pretty flower! You know I LOVE your style and all your fabulous creations - it's been such a priviledge to be on TWO design teams with you and I'm very grateful for the opportunity you & Leslie have given me. I will be stopping by and checking out all of your creations, because yours is one listed in my 'favourite blogs' list on my blog! I must also add a 'thank you' for all you super sweet comments that have made my day and brought a smile to my face on a number of occasions - you really are a gem! This is such a beautiful card...love this flower so much. The past 6 months have been great. Thank you for everything you do and for making this such a fun design team to be apart of. I rarely do flowers and never two step stamping...but you and Vicki make it really hard to resist. I've been blog stalking for you so long, I can hardly wrap my head around the fact that I was on a design team with you. I can't thank you enough for how easy you made it, and all the positive words along the way. Back to my stalking..
Beautiful card! This is the perfect girly creation!